Alice is traveling alone a night, freaked out because a girl keeps appearing randomly next to her moving vehicle. Rose has been the White Queen of Wonderland for a day. She has no idea what she’s doing but her visions are telling her something is coming. 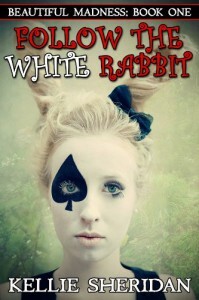 Gwen is waiting for a white rabbit to appear before her, a sign that change is coming to Wonderland. Lucky encounters a white rabbit and suddenly has the ability to travel between dimensions. When Alice landed in Wonderland 150 years ago, she tore it apart. Now the signs are pointing towards Alice’s return and each side wants her for their own reasons. This was a novella, just the beginning of the story and I have to say though it seems a little cheesy at times, it was an interesting start to an Alice in Wonderland retelling. Not much really happens in this book, which is a little disappointing. It’s really more of a teaser. But an interesting teaser. There a lot of questions that need to be answered. You just get little tidbits of different citizens of Wonderland and how they play a part in Alice's return. I will definitely be reading the next book because I have no idea what’s going on. I would recommend this book but maybe wait until the second comes out if you really don’t like being left hanging.